As a wrap up before this weekend’s code camp (http://alabamacodecamp.com), I wanted to upload the entire project so you could have it in one spot. In addition, I’ve also created a VB.Net version. I won’t go back over and comment on everything, you can look over the posts from my last few days for detailed explanations this is simply so you can have the code all in one spot. The C# version of the form looked identical except in the title bar, which reads SSCE C# Version. Here is the complete C# version of the code behind the form. Note there is one difference from the code I put in my previous blog posts, in the LoadARow method I had the parameters in the order of last name, then first name, but in the tnLoadTable_Click when I called LoadARow I had put the cool people’s names in the order of first name, last name. I fixed that in the version below. // if you do the grid won’t be able to display. // to avoid SQL Injection attacks. // order your SQL put the field names in. // Now read thru the rest of the records. // When there’s no more data, .Read returns false. // Don’t need it anymore so we’ll be good and close it. Here is the VB.Net version of the code. I tried to make all of the method names, variable names and comments match the C# version as much as possible. ‘ Create an empty SSCE Database with a password. ‘ does not put any rows in it. ‘ if you do the grid won’t be able to display. ‘ to avoid SQL Injection attacks. ‘ order your SQL put the field names in. ‘ Now read thru the rest of the records. ‘ When there’s no more data, .Read returns false. ‘ Don’t need it anymore so we’ll be good and close it. There you go, the complete sample project for working with SQL Server Compact Edition. If you found this useful, please post a comment and let us know what sorts of applications you build using SSCE. Hope to see you at code camp! Excellent series of SQL Compact articles. In your example you show how to create a table with ExecuteNonQuery(), Is there support for executing a series of create statements in one command? I have a script that works in Management Studio, but when I pull it in as a string and try to run it in the fashion you have here, I get a token error at my first “GO”. Thank you for some simply fantastic code. The example you provided was exactly what I’ve spent far too long searching for. Your are a credit to your profession. Great, clear example, a delight after trudging through the gruesome pathetic Microsoft documentation. I have been struggling with LINQ to Dataset for two weeks. I finally got fed up and looked into SSCE. This was one of the first pages I came across. It was my last! With the help of your sample code I learned everything I needed to know to completely convert my entire project from datasets to SQL tables. After 2 hours of work not only did I get back to where I was with my LINQs version, I completely finished my app. Had I come across this page two weeks ago my app would have taken about 3 hours instead of two weeks!!! You rock and thank you very much for your sample!!! Thanks! I stumbled on your websit and it proved very valuable. I am currently studing ado.net and .net enviroment and believe me, i am not novice in programming. Tremendous service to the development community. I’m about to start a CE project and wanted to get a start some place. Your examples really saved me a lot of time. Thanks very much. First let me say thank you for the help with my first SQL compact. I am just moving from VB6 to VBnet. This is a great example thanks for the time it took to put it together! must be the difference between C# and VBnet but I don’t know enough to say for sure. thanks for this reference… thanks..!!! I didnt managed to find the vb.net version and ended up doing it myself so here it is, in case anyone else needs one too. great sample. thx. ‘ Note: this only creates the table, it doesnt put any rows in it. ‘ Note, do not close the connection, if you do the grid won’t be able to display. ‘ Now read thru the rest of the records. When there’s no more data, .Read returns false. Thanks for the VB 2008 example. It just solved a huge problem for me. Superb descriptions and sample code for novices getting to grips with SQL and CE. Note to Paul (and maybe others): The issue with parsing errors is due to the fact that WordPress changes quote characters to open/close pairs. When you copy and paste back into VS it does not recognise them and they must be changed manually. The double quotes show up (in C#) as syntax errors, but the singles are within strings so do not get spotted by the compiler. You need to search for them and change as necessary. I am trying to create an sdf file with c# webservices on a windows 2003 server box but get this error and can’t find any other help. Can you help me solve this error, please? 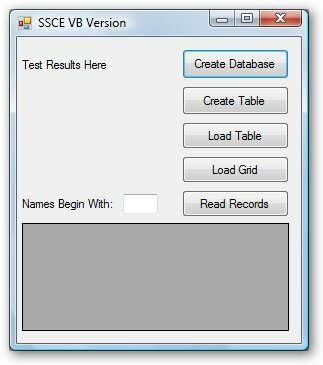 Insert statement is not working in SQLCE. Generates no error. executeNonQuery() returns 1 for affected rows too. but, I am not able to view the added records in the SDF file. any suggestion or provide help! We have the same problem : executeNonQuery() returns 1 for affected rows but when we open the table nothing! We abandoned SQLce and started using SQLite. I doubt we’ll even use SQLce again. It’s got everything the MS product hasn’t, including any silly restrictions where you can use it. It’s also faster and smaller. The learning curve to begin using it is short too. Never say I don’t give you anything. fantastic example. It gave me the kick for building a solution. Having the same error as Matthew two posts above on random installs (XP SP2 and SP3) never had this error on Vista or W7, yet. The error appears when opening a database. The program data are inserted, but when you exit debug mode, the data is not in the database. Thaks to all who contributed. for my windows mobile 6.5 platform on my HTC HD2. This segment looks fine acording to the SQL Compact reference. Thank you! You saved me a whole lot of time!!! but can i use it on pocket pc? I have thoroughly used Sqlite in the past, it is complete, but lacks speed and has bugs, I discovered that Sqlite can’t be used by even 3 Users doing long database operations at the same time. It just locks up. Now only yesterday, I finally realized and was shocked that Sql Server Compact Edition is a hidden magic tool, does all the things i dreamt of. Sql Server Compact Edition 3.5 is the best Embedded Database that you will ever find in the entire world. It is free! No bugs came ever with my handling of Sql CE. How can I sort the DGV by a column other than the primary key? This is very useful! I am building an app for my archery club to track events and archers scores and awards. We have been using Excel so I need to blast a bunch of data into my SSCE DB. This is the ticket! Thanks! Where does the database would hae been stored?? I copied the code as it is, and ran it on my computer, it takes almost a minute to insert 100 records in to the table. Is it this slow for anyone else? Hi, this information its fine, runs even in a Visual Studio 2012; but i need some help connecting my PC with my Pocket PC; im reading a few manuals about it. I found a RAPI.DLL information but i have a lot of troubles. Some one can help me with the code needed for make a program like this controled from the PC computer?